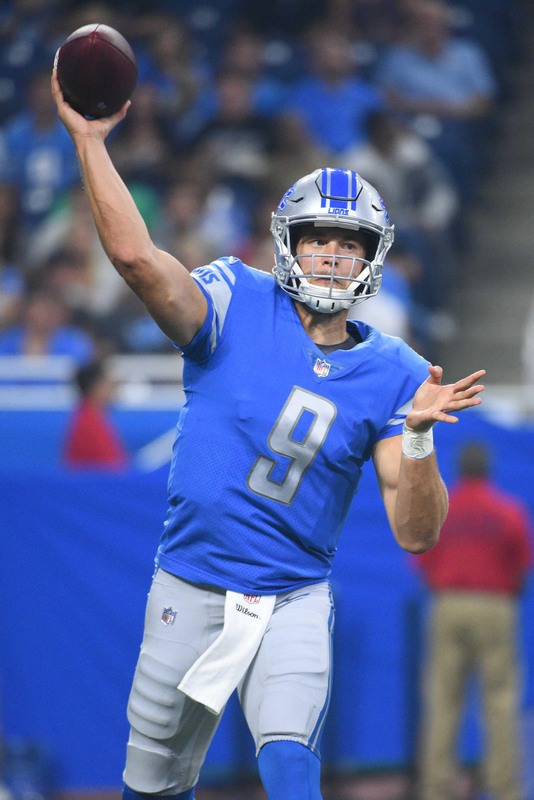 The Dolphins tried to trade for Lions quarterback Matthew Stafford before the start of the 2018 season, multiple league sources tell Armando Salguero of the Miami Herald. The talks did not progress to the point where the Dolphins were asked about what they’d give up, but it’s an indication that the Dolphins were thinking about moving on from Ryan Tannehill earlier than anyone thought. Former head coach Adam Gase, Salguero hears, reached out personally to Lions coach Matt Patricia to orchestrate a deal. The belief is that Gase would have offered at minimum Miami’s 2018 first-round pick and probably more. Patricia, however, said he was unwilling to move on from Stafford. Leading up to the 2018 season, Tannehill missed 20 straight games with a knee injury. But, until word of the Stafford discussions, it was believed that the Dolphins were only looking at QB options in the draft. Ultimately, the Dolphins did not move on a QB class that included Josh Rosen, Baker Mayfield, Sam Darnold, and Josh Allen. Instead, they stood pat at No. 11 overall and selected defensive back Minkah Fitzpatrick. The Fins did not land Stafford, obviously, but they’ve overhauled the QB room nonetheless. Tannehill was shipped to the Titans earlier this month and Ryan Fitzpatrick is now set to start under center in South Beach. Miami is a disaster of a franchise. Jacksonville and Tampa Bay aren’t much better though. Add in the Cards, Bengals, Jets, SF, Browns (we’ll see this season. I don’t believe it), Bills, & Lions as well. Dolphins philosophy move on from one mediocre QB to another. Stafford, Ryan T, and Fitz really don’t inspire fans, sorry. Same thing for my Skins. Two 30 something career backups gunning for the honor of QB1 on the deadskins. They’ll move on from Alex next offseason. What they really need to do is trade back and stockpile picks, or go after a QB this draft. But they won’t. Dan’s history with the team says he’s not interested in building a winner. No they won’t. After this season he still has 35 million in guarantees. He gets one more season Atleast. Smith may retire rather than step on the field in 2020. In 2020, he’ll have to play or retire. I don’t imagine the Redskins will be easy on him at that point – either play full speed or retire. If Smith fiddles around with fake injuries, the Redskins can sue him. They wouldn’t do it over $5 million but certainly might over $30 million of salary cap. Wait till Gruden swings a deal to bring you Dalton…they can reunite …you can then enjoy the red rifle and get him the heck out of Cincy…. Little chance of the Lions trading Stafford when their own record of drafting QBs is pretty dismal. Drew Stanton and Joey Harrington did not exactly set the league on fire. Who in the hell would offer a 1st round pick for Stafford? At ANY point in his career!